Here is a picture of my boy Ranger. 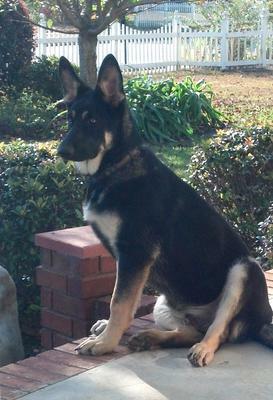 He is an AKC register GSD and was born 11 Jun 13. He is only about 4 months old in this picture and is growing like a weed. He loves to have his picture taken. He is now 10 months old and is already 100 lbs but thinks he is only 10 lbs! He is still very much a puppy and loves to play and climb all over you. He will still be a puppy for another couple of years so best of luck with him as he matures. Your little monster might look like an adult and weigh about as much as an adult be he won't be fully mature until he is around 3 or so, so hang in there and enjoy these puppy years!! If you need more information feel free to scroll through this German Shepherd site at any time to find more information about various diseases and conditions that the German Shepherd often has. Handsome, Handsome Boy!!! German Shepherds are an Amazing breed, so Loyal, Trustworthy, Protective and Loving!!! Take care of your Ranger and he will take care of you!